Some mirrorless cameras offer a narrow choice of in-camera aspect ratios: 2x3 and 16x9 only. If we like to compose in the 4x5, 3x4, 5x7 or other popular ratios, we can apply removable tape to the rear of the electronic viewfinder or EVF. This works well indoors, but under bright sunshine we can't always see the EVF clearly enough for precise composition, focus and exposure adjustment. An affordable loupe like the Hoodman comes to the rescue. 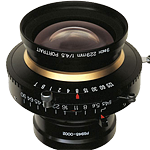 There are more inexpensive models on the market, but be sure to choose one with a diopter adjustment on the eyepiece. 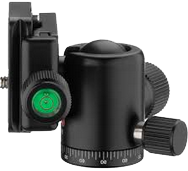 The Hoodman loupe works as designed: in very bright light we can effectively view the EVF. If the EVF has been masked to a different aspect ratio, we can compose in that ratio. In-camera control of aspect ratio would be ideal, but this solution will mimic that missing feature at an affordable price point. The diopter adjustment works well and we see a clear image with no barrel or pincushion distortion. The Hoodman works nicely when the camera is tripod-mounted and we wear the loupe on a lanyard. In other words, it functions best when we use it like a loupe. There is nothing to attach to the camera which might damage the paint upon removal. If you've ever tried working at short range with a small tripod-mounted camera, you'll know that minute adjustment of position can be troublesome. An affordable four-way focusing rail like the Neewer makes it easy. Four-way rails allow you to precisely move the camera from side to side or front-to-rear. Be sure to choose a model where everything is geared and the positions can be independently locked. After shooting with a view camera for decades, many of my photographs are made at close proximity to the subject where even a slight change in camera position has a pronounced effect on composition. For example, see these photographs of Tulips which were made with a Sony mirrorless camera only inches from the flowers. Exact camera position can make or break an image. To see a brief Youtube video about the Newer 4-way Focusing Rail, click here. Another advantage of a 4-way focusing rail is that we can position the nodal point of the lens directly over the the tripod's center of rotation. This step is critical for making successful stitched panorama and mosaic images at less-than-infinity distance. The image above was made from 16 exposures, employing both focus-stacking and mosaic stitching to provide unlimited depth of field and avoid parallax artifacts. For focus-stacking I use Helicon Focus and for stitching I use Photoshop. Click on the bull's eye at right to view it at full size. There are 50 equal-sized steps from the center of the circle to the edge. Can you see them all ? If your monitor is calibrated properly, it should appear perfectly smooth along the entire tonal scale. If not, your monitor needs calibration. It's not good enough to discern a step-wedge with only 10 or 20 steps For high fidelity, 256 steps are best but 50 is a good starting point. Don't be surprised if you can't distinguish 50 tones - especially at the dark end of the scale - even after profiling your monitor. Consumer grade displays can't reveal the low values because they are optimized for high contrast, brightness and saturated colors, not for optimal rendering. Want another surprise ? Try printing this image. Apple Retina displays have high resolution and vibrant colors but can't separate low values even when set to their maximum brightness: my 2012 MacBook Air actually does a better job. Consumer grade monitors are not designed for printing ! To perceive the entire range of tones, graphhic arts professional use professional grade monitors like Eizo and NEC SpectraView. For further discussion, see The K7 Standard and Monitor Display Systems on the Piezography blog. Printing with Piezography, we can produce 256 distinct shades of gray, even though many monitors cannot. Professional grade monitors come with their own built-in calibration sensors and software, optimized for the monitor. Professional grade monitors have their own internal LUT (lookup table) where they store the results of calibration, rather than adjusting the computer's own graphics card in an effort. You can see the difference with your own eyes. 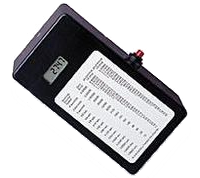 If you don't want to purchase a professional grade monitor, it's still a good idea to calibrate your consumer grade monitor with a dedicated calibration tool and software. If you intend to make prints, be sure to choose a tool that lets you adjust the brightness (luminance) of your monitor, to more closely match the properties of your printing paper. If not, you end up wasting time and materials. These tools change frequently. For a current list of recommended monitors and calibration tools, see the Chromix web site. 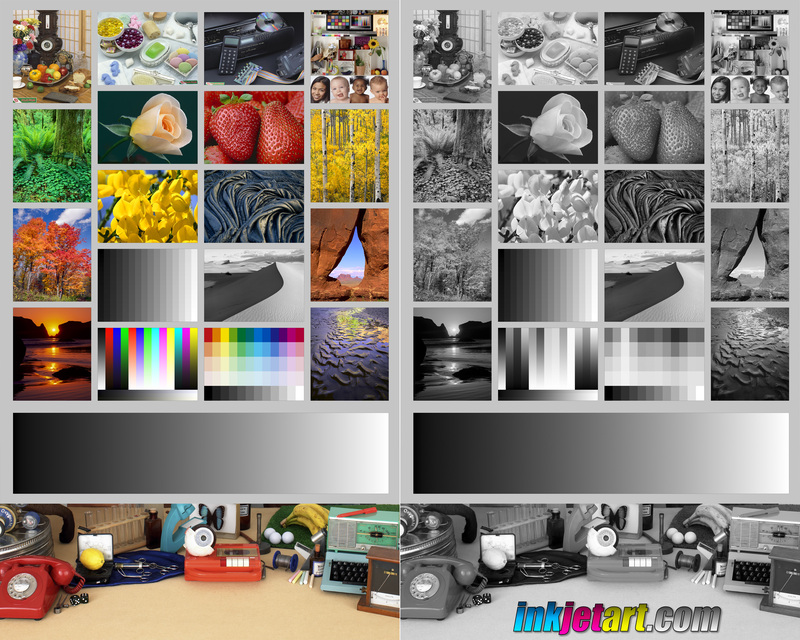 For a target file which contains 256 shades of gray, you can download MicroGrayTest.tif from the Hutch Color web site. Many equipment testers fail to observe even the most basic principles. They snap some hand-held JPG images of ducks in a pond, share them at small size and pronounce the lens as "crazy sharp". They produce lengthy and opinionated videos with low-res image samples which provide no evidence to back up their recommendations. We should be careful not to make any purchasing decisions based on this superficial level of evaluation. 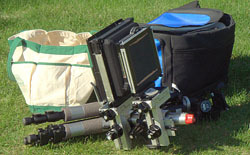 To test equipment properly, the camera should be fixed on a rigid tripod. The subject should be flat, stationary and unchanging, like a resolution target, a newspaper or distant scene. Lighting should be typical and unvarying. The camera should be set to its best ISO and in RAW format. Lenses should be manually focused at actual taking aperture (not wide open) to avoid focus-shift. Images should be examined with no sharpening or corrections and compared side-by-side at 100% magnification. Professional equipment testers like LensRentals.com compare multiple samples of the same lens under controlled conditions. They measure center, middle and edge performance as well as de-centering, etc. They produce charts, not just snapshots. Phillip Reeve doesn't produce charts but his tests are rigorous and the results are easy to discern. Another fine non-laboratory tester is Christopher Perez. Fred Miranda does a nice job of testing lenses. For example, see his FM Rolling Review: Sony FE 135mm f/1.8 GM. If you don't mind purchasing a subscription, Lloyd Chamber's digilloyd is full of helpful information about a huge variety of cameras, lenses and other equipment. He provides sample shots taken at various apertures and sized to different resolutions. You can really see how equipment performs. Nasim Mansurov's Photography Life has a very good series of articles about lenses and their problems. Read What is Focus Shift? and others about de-centering, vignetting, curvature of field, etc. To put it all together, see How to Read MTF Charts. At the left is the histogram of an 8 bit grayscale image file. Because of the shallow bit-depth, we can observe gaps in the tonal scale. This is also known as banding. As we continue to adjust the image, banding gets worse. The more corrections we make to 8 bit images, the more artificial they can look. For best image quality, we want to avoid banding. If we simply change the file mode from 8 bit to 16 bit (Image > Mode > 16 Bits/Channel), Photoshop will not interpolate new values to provide intermediate tones as we perform adjustments. Here's the trick: after converting to 16 bit depth, change the size of the image, even slightly. This will force Photoshop to interpolate all the pixels. As the histogram on the right demonstrates, the tonal scale is now smooth. Any subsequent adjustments to the tonal scale will be performed in 16 bit and no banding will be introduced. Smooth ! Here is a brief tutorial on Scanning Tips with Epson flatbed scanners but it applies to any scanner we use. To make a digital image which looks as analog as possible - as smooth as possible - we need to work around some of the default settings provided by the scanning software. With my consumer-grade Epson flatbed scanners, the green channel is slightly sharper than the red and blue channels. Read Scanning the Green Channel for Optimum Resolution to learn more. Piezography K7 Carbon pigment prints are made with a graded set of pure carbon pigment instead of colored inks. They look beautiful and unlike ordinary inkjet prints will last as long as the paper holds together. 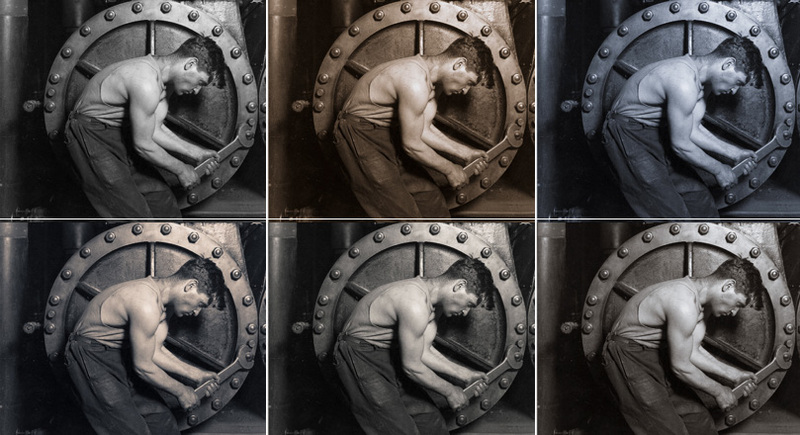 These images are considerably more fade resistant than archival selenium-toned silver prints. Unlike the color images we can make using OEM inks from Epson, Canon, HP - whose colors fade and drift at varying rates, depending on paper, lighting and storage conditions - carbon pigment prints do not fade appreciably. To see how color inks fade and drift over time, see Aardenburg Imaging, an independent testing service. Piezography Pro is impressive: superb tonality, highest dMax, optimized gloss and matte options. Most important: the ability to combine neutral, warm and cool shades along the tonal scale. My favorite toning effect consists of warm shadows which smoothly transition to neutral high values: a linearized blended tone. The Piezography inks sets consist of 6 or more graded inks made of pigment, not dye. Given that the ink is mainly Carbon-pigment-based, this method is considerably more archival than typical color inkjet printing. For monochrome photography, Piezography Pro is Printing Nirvana. 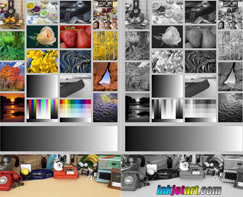 The results far exceed the tonal quality of typical printer inks (3 gray shades) and general-purpose profiles designed for making color photographs. Unlike profiles made with the open-source QTR tool set which are based on only 21 measurements, Piezography profiles are measured and linearized using 128 steps. Piezography profiles are completely linear, with no banding, bumps or gaps in the tonal scale. Subtle tones in the shadows are not compressed to pure black. Highlight tones are not clipped to white. To see what you are missing, print their Proof of Piezography target image. Using Piezography, all 128 steps are clearly delineated in even gradations and your printer delivers better image fidelity than most calibrated monitors (see The K7 Standard and Monitor Display Systems and related articles on the Piezography blog). Print Tool is a custom layout and printing application for MacOS with Epson and HP printers. It can run standalone or with a Quadtone RIP workflow. Print Tool supports JPG, TIF, PSD, PNG and GIF files in 8-bit or 16-bit RGB or Grayscale. One of Print Tool's many compelling features is the ability to print on custom-sized paper with equal borders. This is vital because many of the standard paper sizes do not work with 8x10 and other traditional ratios. Unequal borders can easily spoil a composition: equal borders are a must ! For example, I like to make proof prints on US letter paper (8.5 x 11 inch), with a 1.25 inch border. This comes out to a 6 x 7.5 inch print on 8.5 x 10 paper and is very easy to set up on Print Tool. This requires trimming our 8.5 x 11 inch paper to 10 inches long, as shown above. Another nice size is exactly 10 x 12.5 inches with a 1.5 inch border. We merely trim our 13 x 19 inch paper to 15.5 inches long, as shown below. If you make monochrome prints using standard OEM inks, you can easily give them a "toned" appearance: the blacks are black, the whites are white - but the grays are varying shades of brown, gold, blue, violet, etc. Toned monochrome images often have a greater sense of depth than plain-old black and white. This is especially true of portraits. Many of the great classic photographers toned their monochrome images in the darkroom and thus avoided the harsh and "gritty" quality of pure black and white. They printed with Platinum and Palladium or soaked their Silver prints in baths of Selenium, Gold, etc. Today using digital methods we can render a photograph with any tone we like, choosing the best color for each image. 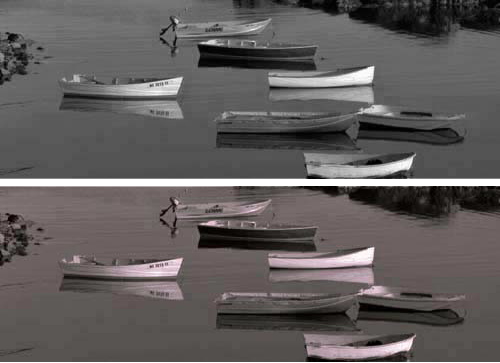 With this method, every image can receive its own distinct toning with a 16-bit high-fidelity palette of shades. Read Photoshop Fill Layer for more information and learn how to do this yourself. Attention GIMP Users: you can do the same thing with the GIMP Colorize tool. I prefer Photoshop but GIMP is free and runs on a wider variety of operating systems. XRite Color Checker Passport Photo 2 is a an affordable solution consisting of a portable target and software. It works with Photoshop and Lightroom to give you accurate color balance wherever you shoot. The tool contains RGB and CMYK values, gray steps and other standard color patches. The newer Passport Photo 2 also contains an 18% gray card. The test photo above was made under typical incandescent home office lighting and shows before and after profile correction. To watch a Youtube video about it, click here and see the X-Rite promotional video here. I love my second-hand 1970's Sinar P view camera. You can easily locate one on eBay, where there's an abundant supply of used Sinar equipment. That's where I found mine. The Sinar is what all the other view cameras would be... if they could. Everything is geared. Every adjustment is smooth and silky. There are very few locking mechanisms, since the gears are so well made, they just stay where you leave them. Did I say Made in Switzerland ? 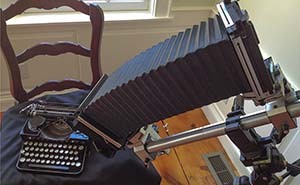 The Sinar has asymmetric or yaw-free movements. It stays in focus when you tilt, swing, rise and shift. With other view cameras, you have to tilt, refocus, then raise or lower the camera - over and over again. With the Sinar, you just focus and dial-in the adjustments until everything is right. It's heavenly ! 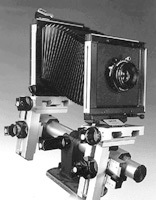 The Sinar is a modular system camera. If you want to add or replace things, you can. Turn your 4x5 camera into a 5x7 or 8x10 camera ? No problem. Just replace the bellows and the back. Search for a conversion kit, also called format change set, conversion set, etc). The kits are smaller, lighter and cheaper than cameras. Because Sinar is/was the workhorse of choice for so many professionals, there is usually plenty of used equipment to choose from, in excellent condition. Igor's Camera Exchange carries a lot of Sinar equipment and expertise. I also have a lovely and ancient 5x7 Kodak 2D, a wooden field camera (left). I found it at an auction and had a new bellows put on. It works fine again. On the left you can see what someone's fully restored 2D looks like. I wish my 2D were as pretty but it works fine just the same. It's the latest in 1920's technology ! The 5x7 Kodak's light weight and folding design makes it great way to carry around. Unlike most folding cameras, the Kodak hybrid design lets you leave a lens on the camera at all times, which makes things easy and fast when setting up. When maximum portability is required, I use a 4x5 Tachihara Wooden Field Camera (right). It's very light and folds quite small. 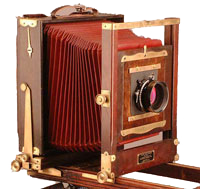 With its red bellows and brass fittings, it attracts curiosity and draws onlookers like a magnet. Using a 200mm Nikkor M lens, it's a treat to walk around and shoot a wide variety of subjects. You can save time and economize space by leaving the lens on the camera, reversed. 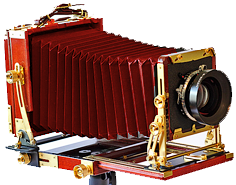 If you would like to see what some other Large Format cameras look like, have a look at this thread entitled Show Off Your Camera on the Large Format Photography Forum. You may be surprised to see how many people use them - and how many different kinds of Large Format cameras exist. Ordinary cameras have lenses that are mounted straight ahead, so they look straight ahead only. That's fine for many subjects but view cameras let us adjust the plane of focus at the front and rear of the camera. We can focus along a complex plane and make photos that are either impossible or arduous with ordinary cameras. Click here to see some photos that were made using view camera movements. Some of these adjustments can be created after image capture with editing tools but not all. View cameras allow us to explore and combine adjustments creatively, while composing the image: something quite different from repairing mistakes in post-processing. With focus-stacking, depth of field can be simulated but not necessarily along an oblique plane. 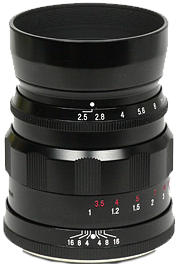 Tilt/shift lenses are available in limited focal lengths for Canon and Nikon cameras. Tilt/shift adapters let us adapt lenses designed for larger sensors or film, but to get more extensive (but limited) view camera functionality with a digital camera, see the Cambo Actus and the Arca Swiss Universalis. For a discussion of some favorite lenses for Large Format cameras, click here. We discuss vintage and barrel-mounted designs, portrait lenses, modern lenses for use in the field - as well as macro and process lenses, the Sinar Copal Shutter and a blur rendition or bokeh and a 4-way bokeh comparison of vintage and modern designs. 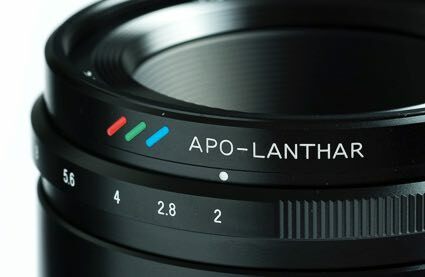 Included are sample image galleries for Rodenstock APO Sironar-S, Rodenstock Macro Sironar, Voigtlander Braunschweig Heliar, Carl Zeiss Jena Tessar, Fujinon A, Fujinon C, Fujinon T, Fujinon SFS, Nikkor M, APO Nikkor and more. You can see that differences between them are often... exaggerated. Here is a family portrait sized at 32x40 inches, made from a 4x5 negative. Here is a photo I made recently with a 1930's Kodak 2D: the detail available from a 5x7 negative is impressive. An 11x14 print is barely a 2x enlargement ! 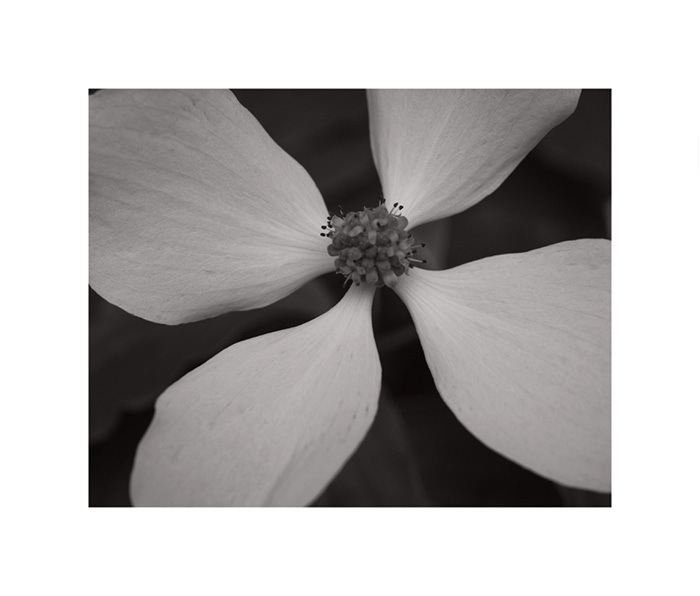 Of course, 5x7 still falls short of 8x10: here's an 8x10 sample image with detail section - made with an 8x10 wooden field camera. It puts the smaller formats to shame. From the large format perspective, the full-frame Sony sensor delivers adequate resolution (42 MP) in a very portable package, allowing us to make 16x24 inch prints at 300 dpi with a few pixels to spare. The tonality and dynamic range is superb, often as good as we can obtain when using large format sheet film. The recently promised 100 MP Sony full-frame sensor will give us a 1.5x linear increase: 24x32 inch prints. At ISO 50 there is no apparent grain or sensor noise whatsoever, even at 100% magnification. To get resolution like this across the entire image, we need to shoot lenses at their best aperture and keep the camera very steady. The larger the print, the more important this becomes. This photo was underexposed dramatically at ISO 100. The shadows appear hopelessly dark. Using Adobe Camera Raw we have lightened the dark values. The A7RII sensor can accommodate a substantial range of brightness from outdoors to indoors. Shooting the above photo, two exposures were made: one an 82MB RAW file, the other a 41MB Compressed RAW file. They were exported from Adobe Camera Raw with identical (synchronized) sharpening, noise reduction and monochrome conversion. Is there a visible difference ? Here are 100% crops from the photos above. On a typical monitor at around 110 dpi, the full image would be roughly 50x75 inches (120x180 cm). Even at 100% magnification, the difference between these two versions is so small that a slight change in sharpening and noise reduction can hide any distinction whatsoever. These drastically underexposed shadow areas were rescued in post-processing. 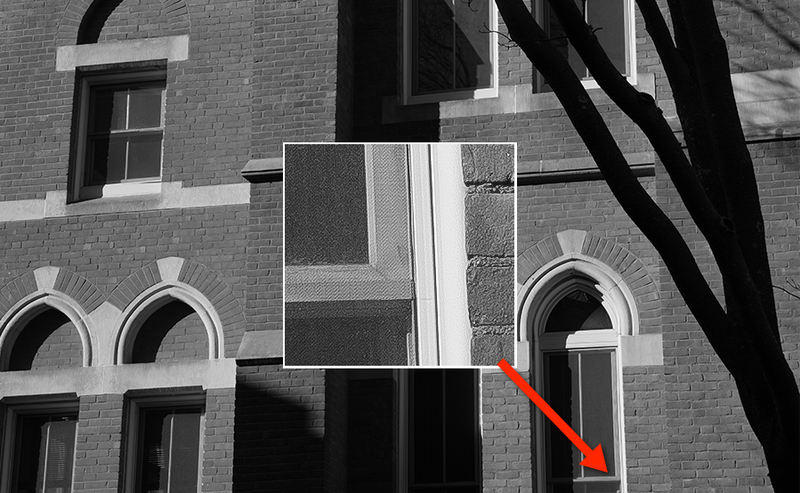 How much of a difference can we expect in a properly exposed photograph ? If we need to save on storage, the Compressed Raw option is very attractive. For an in-depth analysis, see this review by Jim Kasson. According to his test results, with compression enabled at ISO 100 image bit depth drops from 14 to 13 bits. With compression enabled, bit-depth keeps dropping as we increase ISO. At what point this becomes noticeable to you, is for you to decide, based on your choice of subject, lighting and ISO. At high ISO you should notice the most artifacts and noise. To keep up with the latest news and discussion about Sony E-Mount cameras and equipment see Sony Alpha Rumors and Fred Miranda's Sony Forum. Brian Smith's Ultimate Guide to Fullframe E-Mount FE Lenses is comprehensive and regularly updated. Although less frequently updated, here's another survey and evaluation of native full-frame lenses with electronic coupling for Sony E-Mount cameras by Phillip Reeve: Sony FE Lenses: a Comprehensive and Independent Guide. He also provides these additional helpful articles: The Best Lenses Below $499 for the Sony A7 Series and Beginner’s Guide to Manual Lenses on the Sony A7. For news about digital equipment of all stripes, see Digital Photography Review. For fine-art subjects (as opposed to snapshots, sports, wedding and fashion), manual focusing is preferable: we're rarely working quickly and we can't trust the camera to make the right artistic decision. For example, see below where sharp focus has been applied off-center. Because the Sony provides focus-peaking and magnification, it's like using a loupe on a view camera. Mirrorless cameras provide a level of precise focus that can never be reached while looking through an SLR or rangefinder window. Another advantage of manual focus: we can focus with the lens stopped down to the actual taking aperture. This not only helps us preview depth of field, it eliminates focus shift. Sony mirrorless cameras have a very small flange-to-focus distance, allowing us to adapt a wide variety of 3rd party lenses such as Leica, Nikon, Canon, Pentax, Voigtlander, etc. To shoot manual lenses, a simple affordable adapter is all that we need. I was disappointed with a no-name bargain adapter (it developed a light leak which resulted in flare), but have had good experience with Fotodiox Sony E-Mount adapters. For fine art subjects (landscape, still-life, portraits), older lenses are often an excellent choice. Many perform just as well as the newest ones, the only difference being that they are manual focus and have no built-in stabilization. Available in the used market, they are affordably priced. Prime lenses are often best when possible: zoom lenses exhibit focus shift. More importantly, they suffer from barrel, pincushion and mustache distortion and lower edge performance which varies with focal length. Mustache distortion can be troublesome to correct, even with modern software. For this reason, prime lenses are better-suited to photographs of architecture and other man-made objects. Prime lenses are almost always smaller, lighter, sharper and cheaper. There are countless lenses available in the normal focal length but for its combination of image quality, flexibility and low price I chose the 55mm f/2.8 AIS Micro Nikkor from 1979. You can buy this lens used on eBay or from KEH but after decades it is still available for purchase new because it's a fine performer even by modern standards. With this model, no lens shade is required because the optics are recessed within the barrel. Because this lens does not open wide it is light and portable, taking 52mm filters like many other Nikon designs. I love macro lenses: they are usually free from chromatic aberration and geometric distortion. Many standard lenses are sharp but if you like to shoot at close distance without needing an adapter and you appreciate not needing a lens hood or corrections in post-processing, this is a fine choice. For a collection of images made with the 55m f/2.8 Micro Nikkor, click here. The Voigtlander 75mm Color-Heliar f/2.5 was introduced in 1999 and the Leica screw-mount version is portable, affordable and sharp with a 10-bladed aperture and excellent blur rendition. Although not officially a macro lens, it performs very nicely at close range using a stretch adapter or extension tubes. There is a very slight pincushion distortion which is easily addressed by the Adobe Camera raw profile for this lens. The lens shade is integrated into the design and the lens cap fits over the shade, making it even more portable in actual use. Weighing only 230g, it takes 43mm filters and is only 65mm long: less than the width of many modern designs. Even with the lens hood in place and an adapter attached, this lens fits in your pocket ! You can carry it for long periods of time. There are faster lenses in this focal length, but I prefer lenses which do not open very wide: they are smaller, lighter, more affordable and optically superior. Lenses which open wide often have mediocre performance at wide settings, particularly away from the center of the image. If not, they are prohibitively expensive, large and heavy. For a collection of images made with the 75m f/2.5 Color Heliar, click here. 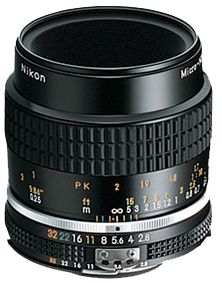 The 35-105mm Zoom Nikkor Macro was introduced in 1983 and is available at modest price in the used market. A manual focus zoom, it opens no wider than f/3.5 so it's compact, taking 52mm filters like the 55mm Micro Nikkor and many other Nikkor designs. As with all zoom lenses, sharpness at the edges falls below center sharpness and if you're looking for best image quality this lens is better suited to APS-C format where we use only the central 2/3 of the full frame format. With full-frame we can crop to either the 4x5 or 5x8 ratio. It's a capable performer in a portable package. Shhh, don't tell anyone! This lens has 16 elements in 12 groups and a ring which shifts the internal arrangement, allowing you to gradually transition to macro mode. At the 35mm setting, it can focus down to a 1:4 ratio. If we add a short extension tube the lens will focus very closely at all focal lengths. Because of the macro design it performs well at short range as well as distance. For a collection of images made with the 35-105mm Zoom Nikkor Macro, click here. 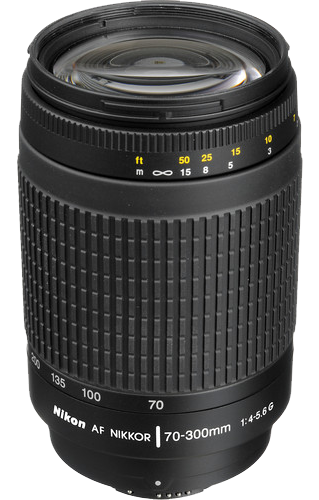 The 70-300mm Nikkor AF ED is very affordable and portable compared to similar offerings. This model provides autofocus on Nikon cameras, but no image stabilization. Like most zoom lenses it exhibits some pincushion distortion. I rarely shoot it wide open and I use a simple Fotodiox Nikon-to-Sony adapter which does not provide autofocus. 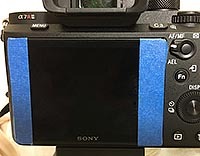 To get higher resolution or built-in image stabilization, professionals who make very large prints may require a better lens - at much higher cost - but if we shoot at best aperture, print at reasonable size and avoid the corners of the sensor, this lens offers long reach and light weight at an attractive price-point. For a collection of images made with the 70-300mm Nikkor AF ED, click here. If we crop a full-frame 24x36mm digital sensor to make prints at 8x10, 11x14, 16x20 etc, the sensor becomes 24x30mm. Reducing the horizontal dimension by 20%, all lenses give a 20% greater effective magnification. For example, a 42mm lens on this cropped full-frame format functions like a 50mm "standard" lens... etc. Those of us who shoot 4x5 inch film are likely think in focal lengths for that format. Given the blank film edge, 4x5 film is actually 3.75 x 4.75 inches, or 96 x 120mm. If we crop our full-frame camera to 24x30mm, there is a conversion factor of 4X because 96/24 = 4. 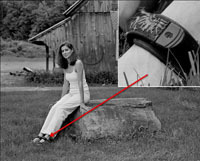 Therefore a 50mm lens on cropped full-frame is like a 200mm lens on 4x5. A 55mm lens on cropped full-frame is like a 220mm lens on 4x5... the perfect focal length ? If we don't crop but use the entire 24x36mm sensor, the conversion factor is 120/36 or 3.33X. A 50mm lens on un-cropped full-frame is equivalent to a 165mm lens on 4x5. Don't purchase a set of filters for every "odd-ball" size (and carry them into the field). An inexpensive step-up ring can save you money, space and weight. Among lenses for large format of recent manufacture, the majority take 67mm filters. 52mm is also a popular size - my favorite size in fact. Almost all my lenses take filters that are either 52mm or 67mm but not all of them... so I fixed that. 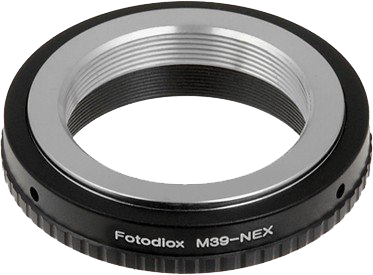 Purchasing 49-52mm adaptor for my 150mm Rodenstock and a 55-67mm for my 300mm Fujinon A, I now need only 2 filter kits: 52mm and 67mm filters. You can do the same with your lenses too. You'll need a lens cap for each lens that you convert. They are very affordable and readily available. A 150mm lens needs 150mm of bellows draw - at infinity. As we focus closer, more bellows extension is required and more exposure is required. How much more ? For perfect exposure, we want to know. For a lens of given focal length and bellows with a specific maximum extension, how close can we get to the subject ? If we want a certain degree of magnification (say 1:3) and we know the focal length of the lens, how much bellows extension do we need ? With a lens of given focal length and a bellows of known maximum extension, how much magnification can we get ? At 1:1 magnification, a 150mm lens requires 300mm of bellows extension. How do we compensate for exposure as bellows extension increases ? Click here for a page which provides formulas for bellows extension. If you don't care to memorize the formulas for bellows extension and film reciprocity, consider this wonderful application for the iPhone: Reciprocity Timer by Pump Interactive. It really works ! This tripod is neither the largest, smallest, heaviest or lightest - but the Bogen 3021 BN Pro is an affordable all-around solution. It's built strong enough and light enough. It's not made of carbon fiber but unless you are a trekker... who cares ! Sorry, I do not recommend ball heads: when we adjust the camera in one direction, we lose the other two planes of orientation. Ball heads are hit-and-miss. They drift as we tighten the knob, due to the weight of the camera. For precise work, they are practically useless ! I recommend geared tripod heads for general use. For careful positioning of small cameras at close distance, I recommend a 4-way Focusing Rail. 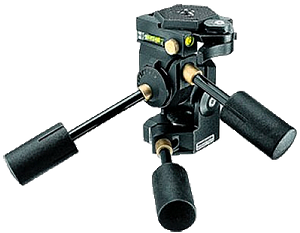 I like the Manfrotto 3275 410 geared tripod head, which is rated for holding cameras up to 11 pounds. It lets you make fine adjustments in 3 directions, independently. It's small, light and strong. It's a treat to make adjustments this way: there is no drift. I use it with cameras that are comparatively light in weight, like wooden field cameras and digital cameras. 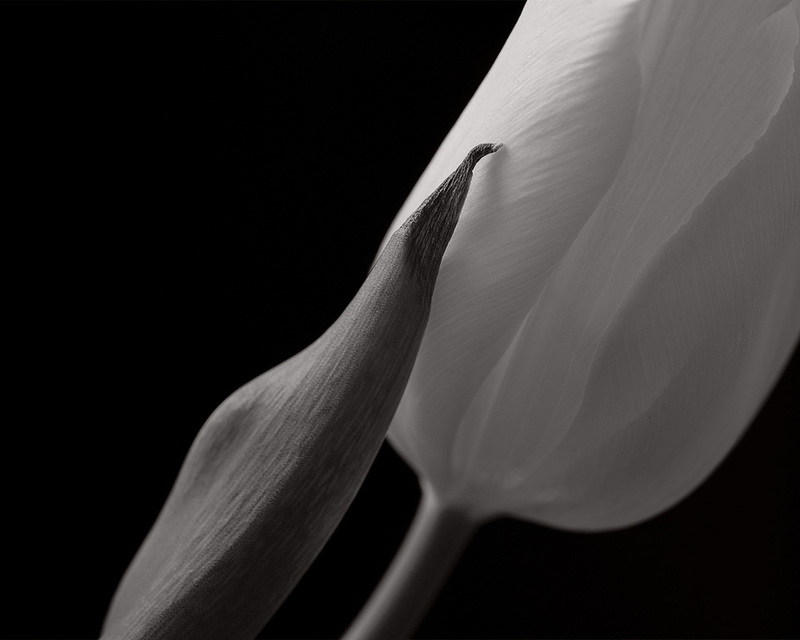 Geared movements let us make minute compositional adjustments, critical when shooting small objects at close distance, like these Tulip photographs which were made with a Sony mirrorless camera. There are better geared tripod heads on the market like the Arca Swiss C1 and D4, but the Manfrotto is considerably more affordable. For heavier equipment, I use a Manfrotto 229 tripod head. It's rated up to 16 pounds and has no problem holding a Sinar P with 5x7 back, extension rails etc. Here's a cold-weather tip: wrap some pipe insulation around the legs and hold it down with some inexpensive duct tape. This will keep your hands warm when you carry the tripod. Pipe insulation is very inexpensive but you will find this very helpful in winter time. It also helps if you want to carry the tripod on your shoulders: it's soft on the body. The Oben CT-3535 Folding Carbon Fiber Travel Tripod with BE-208T Ball Head folds to only 12 inches and weighs only 2.5 pounds. It fits in just about any backpack or shoulder bag and is therefore ideal for travel. It also converts to a monopod and comes with a ball-head that will orient vertically. Ball heads are suitable for travel when weight and size must be kept to an absolute minimum. You can watch a Youtube video about this tripod here. I use this combination when traveling with my Sony A7RII. When possible I replace the Oben ball head with the Manfrotto 3725 410 head shown above. Even though it weighs as much as the tripod, it is finely geared. Leveling Base - What a Relief! 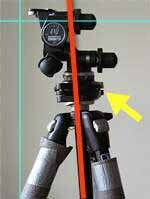 A leveling tripod base like the Manfrotto 438 sits just below the tripod head (see yellow arrow). You get a level platform without having to adjust the legs of your tripod. This piece of equipment doesn't weigh very much but makes life much easier - especially when shooting in the field, where the ground is rarely level. On the right you can see the leveling base in action. The tripod is not level - as the red line shows - but the tripod head is level, because we have adjusted the leveling base beneath it. With such an arrangement, we can pan the head horizontally (or move the 3 gears of the 410 head in any direction we like) and we don't have to correct anything afterwards. To adjust the leveling base, just loosen the lever and use the bubble level. It's much faster than changing the length of the tripod legs. If you've ever tried to work with a tripod that isn't level, you'll appreciate this improvement ! To see a nice Youtube video about the Manfrotto 438, click here. In the BTZS approach, two incident readings are taken: one in the shadows, the other in direct light. The shadow reading determines basic exposure and the difference between the two readings tells us the brightness range (contrast) of the scene, from which we determine development (normal, extended or reduced). Based on development, we adjust film speed. Based on film speed, we determine final exposure. Read Beyond The Zone System by Phil Davis. If we avoid scenes of extreme contrast we can use a simplified version of BTZS incident metering where only one reading is required. When the lighting is not harsh, a second reading is unnecessary. 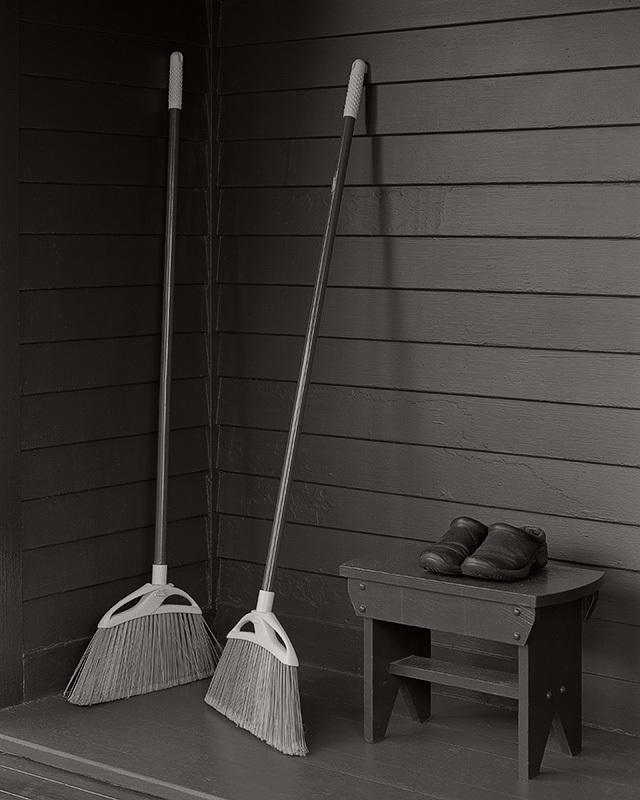 Not every subject has easily recognized tonal values or zones: in this scene for example, we find white objects in the shade and black objects in the light. Sometimes it's a challenge to determine which values belong where. Incident metering solves that problem. We simply measure the light itself: there's no need to identify the zones. When shooting this scene, I relied solely upon a shadow incident meter reading and the exposure was perfect. "Notice that these film speeds seem exaggerated; they are, in fact, just double the normal speeds. As explained earlier, this is done deliberately to compensate for the 1-stop overexposure that normally results when the camera settings are based on the low-light incident reading." For example, I normally rate TMY and HP5+ at 200. When using a spot meter, I set the meter to 200. However, when using this approach to metering I set my incident meter at 400 and make an incident reading in the open shadows. That reading determines exposure. If you can't place the meter in a shadow within the subject, place it in the shadow of your own body and point it towards the camera. There are many incident meters but I like the Gossen Digisix: it's small and precise. It reads a wide brightness range, from EV 0 to to 10 and shutter speeds from 1/2000 second to 4 min. For a link to the instruction manual, click here. Another affordable and portable meter is the Sekonic L-208 Twin Mate. You can read the brochure here. No method is perfect. I have used the Zone System for decades but this simplified incident metering approach is often more convenient and effective. Cinematography students are taught that when filming people, we should determine exposure from an incident reading taken in the shadow below the chin... Sound familiar ? "The origin of the 18% reflectance gray card standard is unclear but it appears likely that it was intended to be used with artificial lighting in the studio and that the original instructions suggested increasing the indicated exposure by 1/2 stop when using the card outdoors. 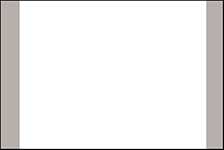 Alternately, it may have originated in the graphic arts, where the luminance range of typical copy subjects is approximately 1.5 in log terms. 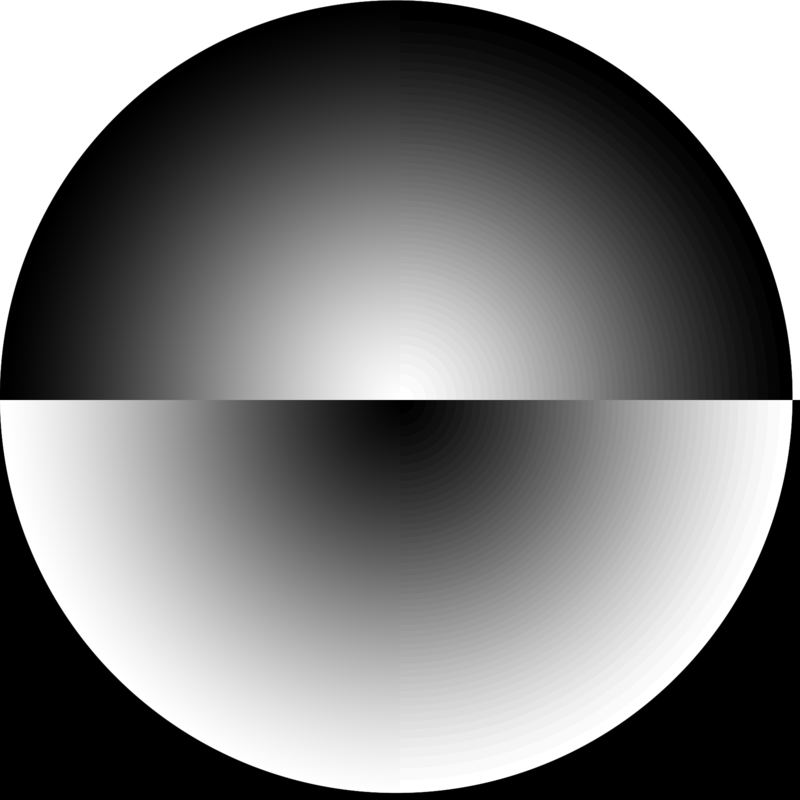 For subjects of this range, the gray card is in fact, a middle gray because its 18% reflectance is approximately equal to a log value of 0.75. The normal range of an ordinary photographic subject, however, is generally considered to be 7 stops, or 2.1 in log terms. The middle gray of this range is 1.05, which translates to a reflectance of about 9%. If the geometric center of the normal range is considered to be middle gray (which can be debated) the standard gray card is a full stop too light in value." In other words, the 18% standard is only appropriate for shooting subjects whose brightness range is 5 stops: black ink on white paper under copy lighting. Kodak's 18% gray card was designed for that. When shooting outdoors, Kodak tells us to increase exposure. Otherwise an the 18% card will give an inappropriate reading. Unlike black ink on white paper, normal subjects have a 7-stop range. A simple "Zone V" gray card reading with a reflection meter will fail: we will underexpose by 1 stop. Why ? Because the middle of a 7-stop range is 9% gray, not 18%. We should place the 18% card on Zone VI, not V.
Some Zone System teachers work around the flaw inherent with use of an 18% gray card by recommending that "shadows" be placed on Zone IV (instead of Zone III). That will work only if our subject contains something we can meter which should be placed on Zone IV: a white birch tree in the shade ? a black horse standing in the shade ? Because they are in the shade, should both be placed on the same Zone ? At right is an image which can tell you if your monitor and printer are reasonably color-calibrated and profiled. Click on it to see it full-sized. You should be able to see all the shades of all the colors. Can you see the purple rocks in the fish bowl ? Is there plenty of detail in the shadows of the sand dunes ? Now print these images on your printer and see if the final results looks like what you see on your monitor. Ideally, they should match, very closely. If they don't match, then perhaps your monitor is off or your printer needs to be profiled... Probably both ! Ideally, we should have our own custom profile for every combination of printer/paper/ink that we use. The same ink has a unique response to every different kind of paper - and every printer is unique. They are mechanical devices, subject to variation. Just like musical instruments, they need to be tuned up, all the time. Printer manufacturers like Epson now make profiles for their own printers/inks/papers freely available for download and tools like Photoshop allow you to print your images with the profile of your choice. These are not as good as getting your own profile but they're a great place to start and you can't beat the price ! It's hard to get things right, even with all the right tools. Without a calibrated workflow, it's almost impossible ! For best results with color printing, get someone like CHROMiX to make profiles for you. If you only print with one paper, you only have to get one profile made when you get a new printer. If you're printing black and white exclusively, use Piezography. If you don't want to have a custom profile made, then at least get one of the profiles from the public domain. Thanks to InkJetArt.com for the test image, which comes from Bill Atkinson. Even if your monitor has been recently calibrated and you are printing with a custom profile for your printer/paper/ink, you may still end up struggling to match your prints to what you see on your monitor. Why? Because LCD monitors are much brighter than paper and manufacturers are making monitors brighter with each new generation. When editing photos to be printed, we need to work at the brightness level of paper. If you have a light meter, you can see for yourself that bright office illumination is such that a white piece of paper, or a white wall, gives an Exposure Value or EV, around 9. Actually, EV 9.3 is around 80 cd/m2, so that's good level for digital printing if your photos will appear in a brightly lit office or gallery. Many homes (and some galleries) are darker than that, more like EV 8, 7, or 6 or lower. We need to lower the brightness of our monitor to match the brightness level of our intended display area. If you don't have a light meter you can use one of the many phone apps, like Luxi. Be sure to use the value for ISO 100, since that is the standard. Typical LCD monitors don't do well at these levels: they are designed to be brighter than standard office walls. That's why print imaging specialists don't use consumer grade equipment. Instead they use monitors like Eizo and NEC SpectraView, which are designed to perform at paper brightness. Here's a superb video presentation from Andrew Rodney: Why Are My Prints Too Dark ?. 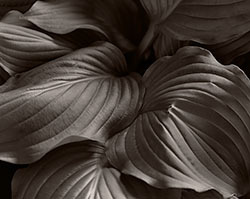 Here's a nice article on the Shutterbug web site, entitled Are Your Prints Too Dark ? Here's another one, by Pat Herold of CHROMiX. It's called My Printer Is Too Dark on the CHROMiX Color Wiki. In order to make Inkjet photo papers look whiter, manufacturers not only bleach them, they add OBAs: Optical Brightening Agents. Brighteners are commonly added to laundry detergents to make white clothing appear cleaner and brighter. When exposed to daylight (which contains UV light), the OBAs luminesce. They emit blue-white light. The brighter the whites, the deeper the blacks look by comparison. It sounds great, no ? The problem is that under indoor lighting, they don't luminesce, so your images look dull. With less blue, the same image suddenly looks pink. This effect is known as metamerism, or color shift: your print looks different, depending on where you view it. While harmless for family snapshots, it's unacceptable for Fine Art prints. Traditional Silver-based photographs don't suffer from Metamerism - and neither should a good inkjet print. To make matters worse, OBAs fade over time. Even if the image looked right under daylight, it starts to look wrong eventually. The print you spent so much effort to make, is slowly replaced, so to speak, with something else. Not all papers have OBAs: some are made with 100% Cotton Rag, have no OBAs and exhibit no color shift. 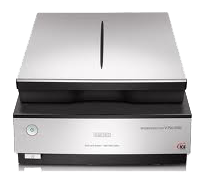 Two papers I recommend are Epson Hot Press Natural and Premier Smooth Hot Press. Another brand I really like is Canson Infinity Museum Quality 100% Rag papers. Be sure to look for papers which have no OBA's. Canson writes "No Optical Brighteners" right on the front of the box. I like their Rag Photographique: it's very smooth, 100% Rag, has no OBAs and a great color. To see how different papers and inks fade and change over time, see Aardenburg Imaging. Mark McCormick-Goodhart is a first-rate scientist and a world class expert in the field of image permanence. You will love Kodak TMAX 100, TMAX 400 and Ilford FP4+ and HP5+ films. These films have long straight response curves, which means they give realistic detail throughout the tonal scale. They also have a very linear response to changes in development time, which makes them easy to use in both high and low contrast lighting. If you are familiar with the Zone System, this means that they are easy to "expand" and "contract" with changes in development. Ilford offers their film in a wider variety of sizes than Kodak and at lower prices too. Tabular grain films like Kodak TMax and Ilford Delta have grain that is flat, or tabular - rather than round. The result is a cost savings for the manufacturer, because a thinner layer of Silver is required. Tabular films require more sensitizing dye and thus require longer washing times to remove the dye. Traditional films like Tri-X, Ilford FP4+ and HP5+ need less washing, because there is less dye to remove. The D-23 developer formula has only 2 ingredients but produces clean negatives with fine grain, excellent tonal separation and good film speed. It's so simple, you can mix it fresh every time. There's no need for a stock solution - nothing to expire on the shelf and surprise you. Click here for additional photographs and more information about D-23 . It's very similar to D-76 but contains no Hydroquinone (and no Borax). As a result, it works a bit more slowly, with less danger of "runaway" high values. 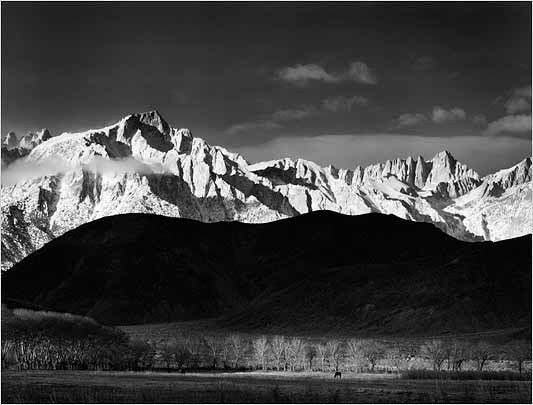 Ansel Adam's classic image "Winter Sunrise from Lone Pine, 1944" was developed in D-23. Click here to read more about his lovely photograph. D-23 is a one-bath developer. It is not the same as Divided D-23 which is a 2-bath formula. Divided D-23 is also known as DD-23. Are you looking for Divided D-23 ? See this article. You can make your own Odorless Stop Bath using Citric Acid. 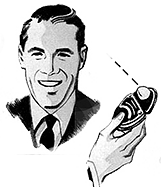 The Kodak SB-8 formula calls for 15 grams per liter, or 1/2 oz per quart. Or you can also use plain water for stop bath if you like. Using an acid stop bath, development is stopped instantaneously. Using water, it is stopped also, just not as abruptly. I use a weak solution of Citric Acid: 1 teaspoon per liter. Citric Acid is very cheap, harmless and... odorless. In the USA, a good source for materials is Artcraft Chemicals. You can mix your own Fixer, using the traditional T-3 Alkaline Fixer formula. It has only 3 ingredients! 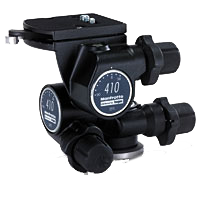 Alkaline fixers require much less time to remove via washing and do not require a washing aid. They have much less odor too ! Can be formulated to have low odor. The T-3 Alkaline Fixer formula is intended to be diluted 1+4. Instead of making stock, you can make a working solution by dividing the amounts by 5 (see table above). It's fun - and far less expensive - to mix your own chemistry. Many of the classic formulas are available in books and on-line at sites like Jack's Photographic and Chemistry Site. In the USA, a good source for materials is Artcraft Chemicals. Kodak adds a magenta sensitizing dye to its TMAX films. Depending on your water and other factors, that dye can be hard to remove with ordinary fixing and washing. Do not prolong the time in the fixer: that will not remove the stain. Instead, rinse your negatives briefly in water after fixing, then soak them in a 10% solution of Sodium Sulfite for around 10 minutes (1 teaspoon per liter of water). Then rinse and wash normally. Sodium Sulfite is the active ingredient in Film and Paper Washing Aid: if you use an acid fixer, you will need that anyway. If you use an alkaline fixer a washing aid is not required but a soak in Sodium Sulfite will remove the magenta stain if necessary. In the USA, a good source for materials is Artcraft Chemicals. Some people purchase expensive custom equipment to wash their film. Nowadays, you can construct your own washer out of inexpensive and widely available materials. A Dish Rack Film Washer costs only a few dollars. Your film just soaks, in a bunch of standing water. There is no need for a fancy syphon or drain system: Just let the film soak and replace the water now and then. Save the water and let diffusion do the work for you. You can use a similar technique to wash roll film too. Photo trays are great for developing prints but you can do things better - and cheaper - with items available almost anywhere. 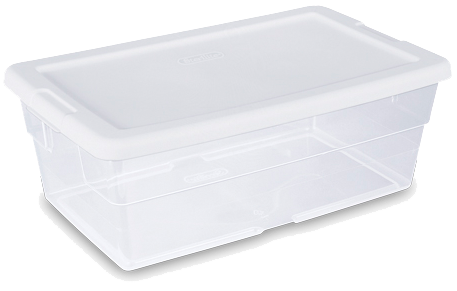 Plastic Food Containers are more affordable, use less chemistry, prevent scratches and require less room. Once you try them, you will wonder why you ever used traditional "Photo Trays". Once you start using something like this ATN Viper Night Vision Monocular, you will have a wonderful time developing, loading and unloading black and white film in the dark. You can see everything, without fogging the film. If you're cramped into a small space, there's no chance of knocking things over. You can perform Development by Inspection (DBI), not in the old fashioned way (where you get only a brief peek under a dim green bulb) but throughout the entire process: development, stop bath, fix, etc. You can do tray development with ease, with far fewer scratches and with greater confidence that things are turning out right. This tool pays for itself - the first time you use it ! Important Note: As development proceeds, the film looks darker and darker. If you examine only the emulsion side, you will get the erroneous impression that development has proceeded too far, too quickly. To determine development, do not judge the emulsion side. Examine the shiny side of the film. Be sure to practice before risking any important work and use your darkroom timer too. There are many kinds of Infra Red Night Vision viewing devices and this one is simple and affordable. If you can't see the ATN Viper on the Optics Plus web site, try this eBay search. If you handle film, make sure to keep your finger tips clean. It's easy and affordable to clean them with a bit of Isopropyl Rubbing Alcohol on a clean cloth or paper towel. Clean your fingertips before loading sheet film. Clean them before unloading and developing. Clean them before hanging film to try. Clean them before scanning film. You'll be glad you did ! You can scan your negatives with an affordable flatbed scanner like the Epson V750 and the Epson drivers which ship with the scanner. A 4x5 inch negative, scanned at 2400 dpi (samples per inch), gives a 115 megapixel image. A 5x7 inch negative, scanned at the same resolution, gives a 200 megapixel file. Is that enough ? At such high resolution, image fidelity is very good and the tones are... rich ! Tiny JPG files, viewed on the monitor, just can't convey the feeling. An 11x14 image made from one of these negatives is truly lovely. A 4x5 image, scanned in 48-bit Color at 2400 dpi, gives you a 660 MB file... and that's before you make any adjustments ! If you work with large image files - but don't have a super computer with tons of RAM - here's a great video tutorial from On Landscape called Turbocharge Your Photoshop. It shows you how to work with a small copy of your image. You perform all corrections as adjustment layers on the small "guide file" version of your image. The "guide file" can be as small as you like - a tiny fraction of the original size - and your humble machine will have no problem with it. When you are done, you magically transfer the adjustment layers to the original. With this technique, an older machine with less RAM can easily be used for working on scans of 4x5, 5x7 and 8x10 negatives and a newer machine can work on large file much more quickly and easily. 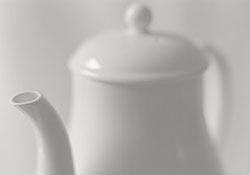 After sharpening an image, strange artifacts often appear at the high and low ends of the tonal scale. These artifacts can make our images look contrived and ugly. Here's a simple method for Photoshop that works well for monochrome as well as color: sharpen the middle tones only. Duplicate the layer that you intend to sharpen. Only sharpen the duplicate layer. Leave the original unsharpened. Select the Layer Style of the duplicate layer. Adjust the sliders to remove the low and high end of the tonal scale. The result is that only the middle of the tonal scale has been selected. Sharpen the new layer to taste. Do not merge the layers before saving. Save the file as a PSD or TIF file with separate layers intact. You can change or even discard the sharpening layer any time you like, depending on the size of your print. Some images automatically look sharper than others: because of visual cues, they convey an impression of sharpness. See Two Barns: One Sharp, One Not for more explanation. If this isn't good enough and you want to sharpen your image even more fastidiously, you can apply this principle three times over. Create 3 duplicate layers (one for each of the low, middle and high portions of the tonal scale) and sharpen each layer separately. Carbon Copy Cloner lets you schedule tasks to back up your files - from one disk to another - as many disks as you like, as often as you like. Back up all your files, or copy only what has changed. Move a copy of your digital files to a backup disk. Back up your OS X system files to another disk. Copy your large Photoshop files to another disk. I schedule these tasks to run in the middle of the night, while I'm sleeping. It's much better than Apple's TimeMachine. It's shareware: you send a voluntary donation if you like it. Some photographers buy expensive cases and packs to carry their gear. I prefer a canvas bag and a beverage cooler. The Sinar P folds down small enough to go into the bag, upside down. The Sinar is built like a tank. The only thing it needs, is a carrying strap and that's what the bag is for. Everything else goes into the cooler, which has a nice sturdy strap to go over your shoulder. The beverage cooler keeps the equipment cool in summer and warm in winter... How does it know ? Even more importantly, it looks like a beverage cooler, to anyone who might see it in the car. Some people like to flaunt the name of their camera, as a status symbol. I prefer the safety of my gear looking like nothing more than a case of soft-drinks. Note the pipe insulation on the tripod legs, held on with duct tape. Pipe insulation is very light in terms of additional weight but vital when shooting in cold weather: it can keep your hands from freezing when you carry the tripod ! Try this affordable and helpful Shutter Speed app for the iPhone. It listens to your mechanical shutter and measures the actual speed. It may not be as accurate as the (now discontinued) Calumet Shutter Tester mentioned below but it's accurate enough. If you want to purchase an add-on light sensor, it will give you very accurate results. I tested my old #4 Alphax Shutter with this app. The shutter is very close to its old-fashioned speeds of 1/2, 1/5, 1/10 etc. That's good to know ! Thanks to Boston-based Architectural Photographer Peter Lewitt, you can see the manual for the Fidelity Calumet Digital Shutter Tester, which is no longer offered by Calumet Photo. 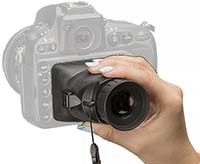 The Shutter Tester allows you to test the shutters on a variety of cameras and lenses. Even though it is no longer sold, you can click here to read the manual. Perhaps you can purchase one on the used market. If you like to control the visual quality of your photos and you acquire equipment from others, it's nice to know how close it is to the correct speed. 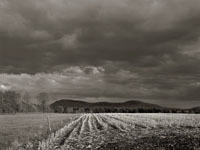 When shooting in black and white, it's common wisdom to use a red or orange filter to darken the sky and clear the haze. For certain subjects this works very nicely but red and orange filters not only remove blue light from the sky: they also darken the blue light in shadows and the green light in vegetation. To avoid ink-black shadows and unnaturally dark vegetation, we can use a polarizer along with a weaker filter if required. Rotating a polarizer, we can control the amount of darkening in the sky according to taste, while maintaining a normal balance of colors in the rest of the scene. 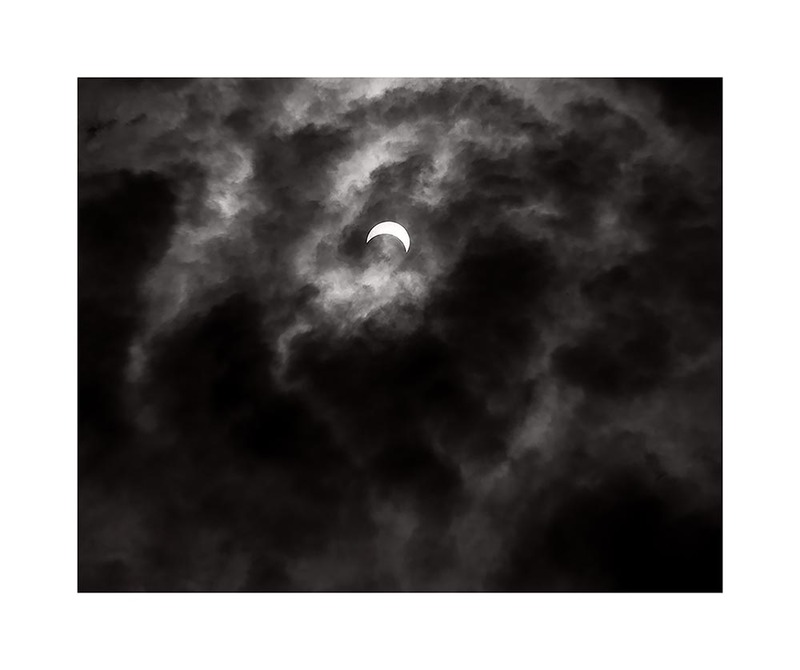 If we need even more richness in the sky and clouds, we can reach for a medium yellow or light orange filter and place it on top of the polarizer. That's how this image was made (on 8x10 film). Note the tones in the grass and the trees: the yellow filter has actually enhanced the details in the vegetation, not darkened them. There is no advertising here: just a lot of free information. This web site gets hundreds of thousands of visits per year and this page is one of the most popular. If you feel that this information has been helpful to you, please consider giving a small donation to support it. Any amount will be gratefully accepted !